Libraries continue to provide a very significant contribution to digital inclusivity in communities. Recently, a survey of libraries in England, Wales and Northern Ireland conducted by the Society of Chief Librarians (SCL) indicates that up to 192,000 people were supported by almost half a million digital skills sessions that took place across the library network in 2014-15. The Taskforce recognises the wider work of Government Digital Service’s Digital Inclusion Charter as a primary way for more organisations, including public libraries, to help get more people online, skilled, and to stay online. The SCL is an active stakeholder to the Charter, and I’m writing to update you about some recent activity which developed as a result of our involvement, and specifically about new partnerships with Halifax Community Bank and BT and Barclays. The BT and Barclays Wi-Fi in Communities project is a pilot lasting two years and focussing on the provision of free Wi-Fi and digital skills support from Barclays Digital Eagles in a range of libraries and community centres across England, especially in areas of social deprivation, with the aim of increasing digital access and skills. Partnership work with Halifax is in early stages, but with both of these pilots, libraries have demonstrated a great ability to work in new partnerships for the benefit of their communities. 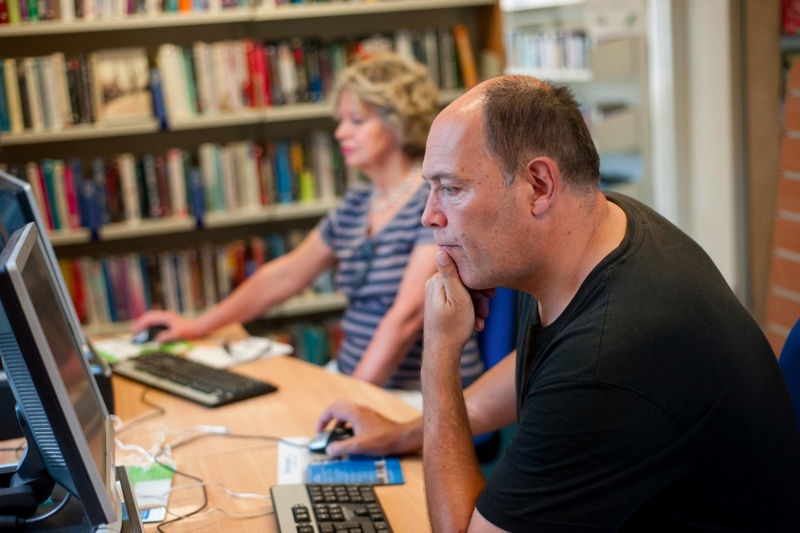 This is an extension to the type of work we see taking place in libraries every day up and down the country: supporting people with very clear needs with their digital skills. Some people visiting libraries have very low digital literacy and digital confidence, and some people have no digital skills at all. 12.6 million UK adults lack basic digital skills and 5.9m people have never been online. 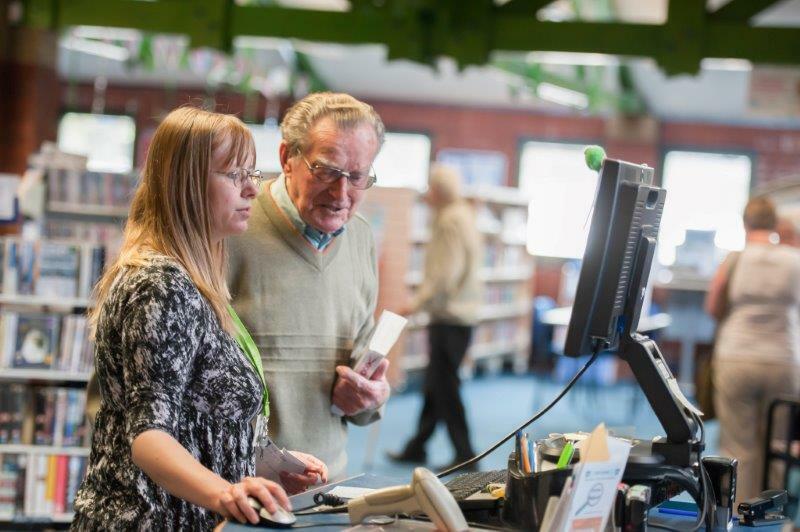 Library staff are very experienced and well trained in providing digital skills support – there is a huge need and demand in this area – and there has been ever since the introduction of the People’s Network in 2000. Improving digital skills continues to form a central area of focus for library services, but the challenge is ongoing, as the skills required advance and develop. Library services have shown their adeptness for new partnerships for many years, and responsiveness to digital skills needs within communities. Partnerships in the past may have focussed on adult learning and getting the best out of the internet or a Microsoft Office package, now libraries are working with partners to create coding clubs, Google Garages, and 3D printing facilities. 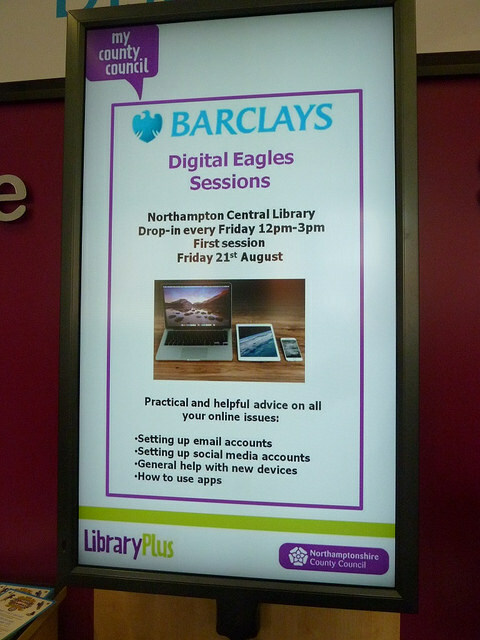 Barclays Digital Eagles already volunteer in 15 library services around the country. The BT Wifi in Communities pilot provides in effect an extension of this partnership working from a local to a national level. The contribution of libraries to supporting digital is increasingly relevant to business and enterprise communities, and adult and family learning, supporting the local digital skills economy. These initiatives will not achieve their aims – to increase digital participation, skills and confidence - to best effect in isolation. We will see more people supported more effectively and with greater reach by working out new connections, new opportunities, and being entrepreneurial and opportunistic. Library services will have to be as customer focussed and facilitative as always, but also more corporate, and with appropriate risk management in place. To reassure stakeholders and customers who will understandably have a view that all off this sounds to be contrary to the ethos of library services to provide free and neutral public spaces, there is no hard sell (or even soft sell) from the Digital Inclusion Stakeholder partners in libraries. The significant workforce volunteer hours presented by Barclays and Halifax are focussed on supporting people’s digital skills in communities. The volunteers from both organisations are very well trained, very skilled, and very dedicated. Just as library staff and volunteers are, of course. So one group should compliment the other. I do not see this as an encroachment or a threat to the skills and qualities of the library workforce – as with most volunteering within libraries (and there are at least 41000 volunteers deployed across England, Wales and Scotland - according to the 2014-15 CIPFA statistics) it is an enhancement, an opportunity, an added value. Volunteers from Halifax and Barclays will bring new and different skills that we may not have in libraries. And in libraries we are focussed, in this respect, on the same business. So I think that we have a choice – our corporate partners could provide those free, neutral digital skills support hours in other venues, or they could provide the support in libraries. There is an expectation that the corporate partners act in a neutral and responsible way, focussing on their corporate social responsibility objectives to help and support people digitally in communities. The same will apply when libraries work with any sector: public sector partners, health sector, tech sector, third sector. As with any pilot within the scope of the GDS Digital Stakeholder Forum, there is ongoing monitoring and evaluation. The partnership working with Halifax started in Calderdale and was evaluated with great support from the Tinder Foundation. This enabled both the library and corporate partners to determine that the pilot worked before considering an increase in volunteer opportunities in this way. The BT pilot will last for longer – two years, with Barclays Digital Eagles available to the libraries included in the pilot six times a year, and with evidence collected during this time. The analysis will focus on the difference the pilot made, and will no doubt lead to decisions at the end of the pilot as to whether there is any extension of it. So there may be no extension to any pilot, and that would not mean a failure – a pilot allows the space for testing, evaluation, re-evaluation, and the ability to work with partnerships in such a way that allows both parties to take risks, to test new things, to work in new ways which respects both partners’ perspectives, is how libraries will continue to develop within the context of the Digital Inclusion Charter. The Taskforce is investigating separately opportunities to invest and fund improvements in library service hardware, and there is a determined recognition that digital skills support in libraries can only support people to the best effect when the kit is a good as it can be. And that, I am sure, will lead to more positive, proactive corporate, tech and third sector partnerships in future, all focussed on making a difference for people in public libraries.